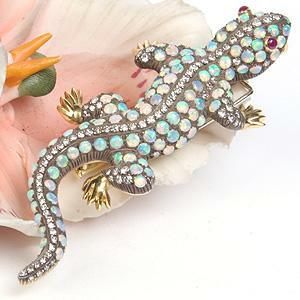 Opal Encrusted Salamander Pin - P2993 at Reliable Gold in Rhode Island Reliable Gold Ltd.
Glorious, captivating opal encrusted salamander pin and pendant in 18kt yellow gold. Opal total weight is 6.18cts, the diamond spine total weight is 1.78cts, with cabochon ruby bezel set eyes total weight .09ct. Double bar pin stem and bale under mouth.